OK, I'm officially cold. Somehow the holidays make the weather seem bearable and being outside, among the lights and decorations is festive enough to overcome the chill. But my annual post-holiday intolerance of all things cold, snowy and wintery has set in. On Saturday, I took Hadley out for a walk as it began to snow. And yes, it's kind of pretty, for a while. But the damp finally got to me and we headed home to a blissfully warm and dry apartment. I will admit that there's a kind of comfort, on days like that, in retreating to a warm bed, piled high with pillows, a bowl of soup and a snuggly dog. And yes, I dried her off first. Nobody likes a wet dog! I had a whole list of DVR and on-demand movies and shows to catch up on, while waiting for the new season of Downton Abbey (finally!) to start on Sunday. Yes, I'm seriously addicted to that show. You? And this soup comes together so quickly, uses ingredients I pretty much always have in the house, and is healthy, too. Maybe cold, snowy weekends aren't so bad after all. In small amounts...in small amounts... Enjoy! Add the olive oil to a large soup pot and, on low heat, whisk in the flour. Slowly whisk in the stock until the liquid is smooth and there are no lumps. Add the onion and potatoes, cover and cook on medium low heat for 20 minutes. 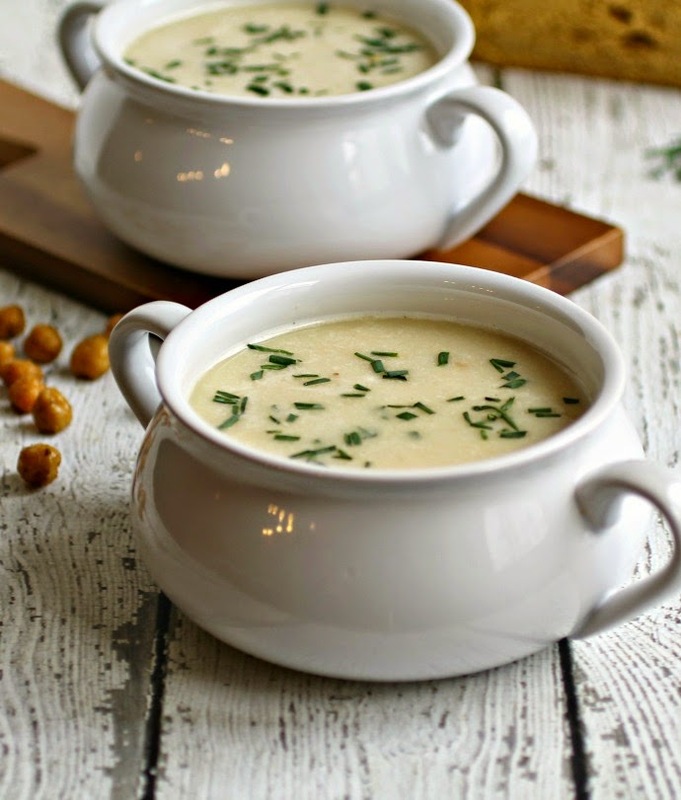 Add the chickpeas and, using either a stick blender or regular blender, puree the soup to be as smooth or chunky as you like. Stir in the milk and chives. Season with salt and pepper and serve with a handful of oven roasted chickpeas, if desired. I think I'd make a double batch of this soup just so I'd have plenty to freeze and reheat for months. You know I'm definitely a fan of curry and potatoes (chickpeas too). Once I discovered that I could watch Downton Abbey online when the UK does, I have never waited for the US season to start again. Why can't they just show them at the same time?! 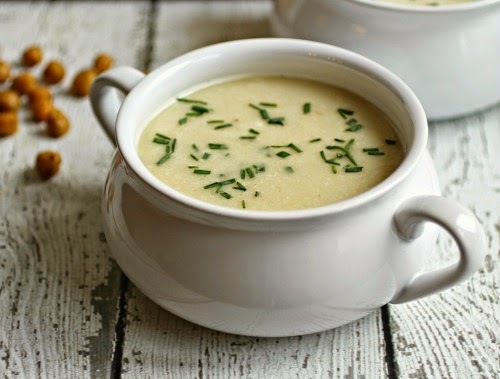 What a gorgeously creamy soup, Anita! Perfect for those cold, damp days. I can take the cold but when it's wet too, I need soup! Oh yes, THIS is what I wish I would have had for lunch today. 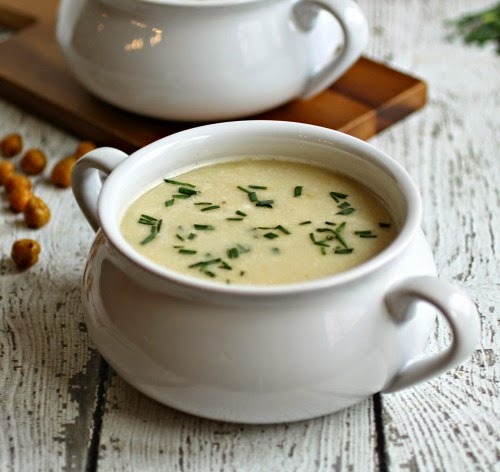 My grocery store makes a curried cauliflower soup that is my idea of perfect comfort food. This looks even better! I really need to start watching Downton Abbey. I'm so behind on the times. 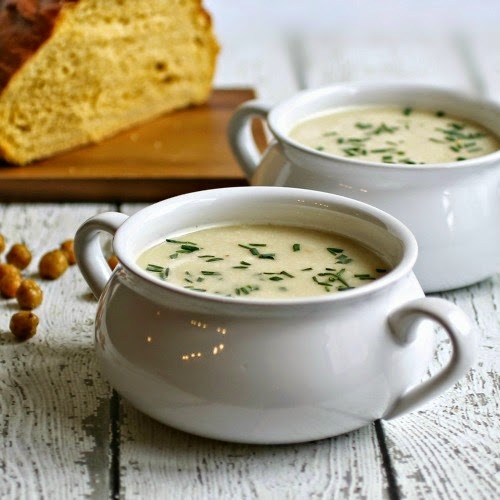 Love this gorgeously creamy soup. Pinned. Oh wow, that looks super tasty! Very heart warming!